Seven months ago, shortly after Republicans on the House Permanent Select Committee on Intelligence shut down the panel’s Russia investigation, the committee’s top Democrat appeared to lay the groundwork for a reopened probe should Democrats take back the House after the midterm elections. Anyone expecting subpoenas to fly upon Democrats regaining control of the committee, for example, will be disappointed, Democratic members told me this week. “There will be some decision making regarding a more selective examination” of certain areas of the investigation, Democratic Representative Denny Heck of Washington told me. “But that’s a different thing from opening the whole investigation again.” Heck, like other Democratic members, said that he trusted Special Counsel Robert Mueller to do a thorough investigation. And he emphasized that while Democrats will have subpoena power if they regain the majority—Schiff has in the past expressed a desire to subpoena Jared Kushner and Donald Trump Jr., among others—he is “hoping it will be a collaborative conversation” if and when the committee wants to call someone to testify. The idea behind downplaying an aggressive investigation into a potential conspiracy between Trump and Russia should Democrats take back the House seems largely the same. 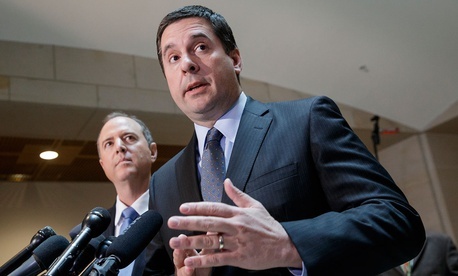 The degree to which the House Intelligence Committee’s infighting and dysfunction spilled into public view throughout Trump’s first 18 months in office—through leaks, television appearances, and press conferences—was remarkable. (The investigation so divided the panel that the Republican chairman, Devin Nunes, considered building a physical wall between staffers.) And it is a case study in how Russia’s election interference has only deepened divisions among the political leaders tasked with responding to it.